A short while back, I took some representatives from FLIR out to the woods with me. (Actually, we went twice, but one of the times was for an upcoming episode of Finding Bigfoot.) On this occasion, I took several folks from their corporate offices in nearby Wilsonville to one of my favorite bigfooting spots in Mount Hood National Forest. At this location, we filmed some promotional stuff for my upcoming appearance at Inframation, the world's largest thermal imaging conference, where I'll be talking about using thermal imagers as a tool for bigfooting. After taking care of the business side of things, it was time to do some bigfooting at one of the best spots I know of. I was unaware that Haley was going to write an article about this trip, but she did. I was also unaware that she really didn't think bigfoots were real, but I forgive her for that. I think she's a bit more open to their reality than perhaps she was before the trip. I did in fact stay at the location after everyone else left. I sat in my chair listening for several more hours before falling asleep. During that time, I heard a strange growl, and three more knocks that were each more distant than the last. Clearly, whatever was making them was leaving the area. Here is a bit of Haley's article along with a link to the rest of it. I hope you enjoy it. Before we go any further, you should know that I don’t believe in bigfoot. I’m a confirmed skeptic. Loch Ness only has fish. Chupacabra is just a goat. Extraterrestrials have better things to do than visit Earth. And there are as many vampires in the rain-soaked Northwest as there are sasquatches (sorry “Twilight” fans). Nevertheless, in my capacity as manager of public relations at FLIR Systems, it fell upon me to coordinate FLIR’s involvement in an upcoming episode of “Finding Bigfoot,” which is broadcast on the Animal Planet network. I was ecstatic about the opportunity. Not to search for bigfoot, but to help promote FLIR and our thermal imaging cameras. But this didn’t turn out to be your everyday behind-the-scenes logistics gig. “Finding Bigfoot” follows a team of Bigfoot hunters as they follow up on sightings around the world. 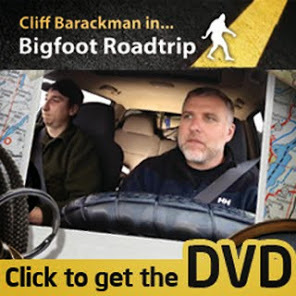 Featuring Matt Moneymaker, Cliff Barackman, Ranae Holland and James “Bobo” Fay, the show is highly entertaining. The fact that they use and promote FLIR thermal imagers makes me a fan. Click this link for the rest of the article. You are such a great ambassador for squatchery. Keep it up.